Tree fu Tom is something Blake had recently taken to - and me too! Broadcast on cbeebies and with a new DVD out this week - tree fu Tom is full of magic and wisdom and each episode is interactive. The show encourages viewers to think, help solve the problems and get up on their feet! Tom carries out a series of moves which have been developed from therapeutic movements designed to help children with movement disorders such as Dyspraxia - Blake loves copying the moves which remind me of tai chi, yoga and Pilates - so I do them too! Makes a great treat for the upcoming half term or Christmas - which is seeking up on us fast! MAGICAL FUN WITH TREE FU TOM: TREE FU GO! Move with Tom, he needs you to save the day and do Tree Fu! Join Tom and his faithful sidekick Twigs on their amazing adventures in the enchanted world of Treetopolis.Tom must harness the spectacular power of Tree Fu and with YOUR help use Big World Magic to avert disasters, save his friends and overcome the epic challenges of the magical and natural world. It’s time for Tree Fu! Pre-schoolers can take a trip to an enchanted world full of sprites, bugs and naughty fungi where movement creates magic as the very first Tree Fu Tom DVD Tree Fu Tom:Tree Fu Go is released on 22nd October RRP £9.99. Featuring the voices of David Tennant (Doctor Who) and Sophie Aldred (Doctor Who) the first DVD features seven magic-filled adventures from the hugely popular CBeebies series. 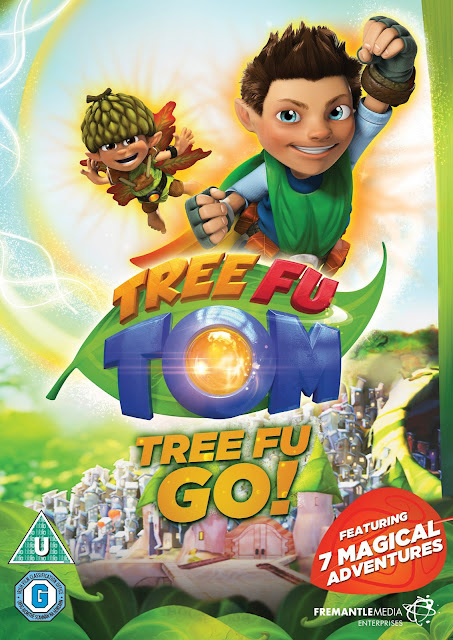 A special limited edition version of the DVD featuring a special Tree Fu Tom figurine with an RRP of £12.99 will be available for a short time only. 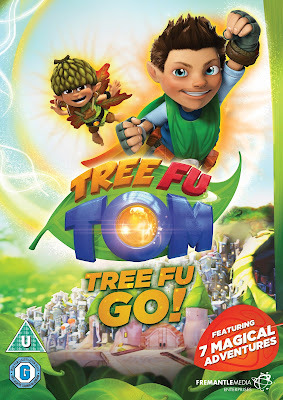 Tom appears to be a normal eight-year-old boy but when he puts on his magic belt and performs a special sequence of movements (known as Tree Fu) he transforms into a tiny but mighty, magical super-hero. Children are all encouraged to join in the Tree Fu magic moves, which are developed from therapeutic techniques that are used to help children with movement disorders like Dyspraxia, but are also designed to assist and enhance the development of all participating children at a crucial time in their growth. Young viewers will delight as they join Tom and his best friend Twigs the Acorn Sprite in the enchanted land of Treetopolis for seven sensational adventures. Things get chaotic at the Biggest Chuckleberry in Treetopolis Contest; Tom needs the audiences help as he bravely leads his friends into the garden of a spider called Rickety McGlum who everyone says is scary; Zigzoo quits inventing just before disaster strikes and Tom must convince him to change his mind whilst battling to save Treetopolis; swapping roles with Ariela shows Tom and Twigs that the grass isn't always greener, and a game of hide and seek looks set to end in a cavernous calamity. 13 thrilling episodes of Tree Fu Tom are available for download via itunes priced £1.19 for HD and £0.99 for SD per episode and HD£10.99/SD 8.99 for the whole series.